The Ultimate Betta Resource Guide. Click here to download now! So you want to get a Betta fish but you don’t have the room for a 5-gallon Betta tank. Well, there are some great small Betta fish tanks out there that can make a perfect home for your Betta without taking up too much space on your counter or desk. Employees at the pet store may tell you that a Betta will be perfectly happy in a small fishbowl or vase, but that’s not really true. Like any fish, Bettas need room to swim and explore, and a tank that’s too small won’t provide that. In general, you shouldn’t keep a Betta in a tank smaller than 2.5 gallons, but you can go as low as 1.5 gallons if you’re willing to perform more frequent maintenance. The smaller the tank, the faster toxins will build up and create an unsafe environment for your Betta. The best Betta tanks give your Betta enough room to swim around, make maintenance easy, and look great. These 7 terrific small Betta fish tanks can make great homes for any Betta. This attractive 2.6-gallon tank is packed with features in a sleek, modern design. The all-glass sides and aluminum trim are eye-catching, and the solid construction means that this tank is built to last. The Fluval Spec III comes with just about everything you need to house a Betta, including an overhanging LED lighting system and a quality filter concealed at the back of the tank. However, the water flow is a little powerful for Betta fish, so we recommend placing a filter sponge over the output. With the slight modifications of adding a filter sponge and a heater, the Fluval Spec III is a great-looking and high quality small tank for your Betta fish. Check out this video on the Fluval Spec 2.6 U.S Gallon. If you’re looking for a simple and fun plastic tank for your Betta that’s also affordable, the Marina Betta Aquarium kit is a great choice. This tank is made of durable acrylic and includes a flip-open plastic lid for easy access to the tank. It also comes with a double-sided background that lets you add a splash of personality to your Betta’s home. Although this is a good little tank, it doesn’t come with all you need to keep a Betta. We recommend adding at least a quality affordable heater, and getting a good Betta fish filter will help you cut down on maintenance. All in all, this is a great no-frills tank for the beginning Betta owner. The Vertex Betta tank from Penn Plax lets you see your Betta from all angles. This 2.7-gallon tank is made from bent glass, so there is no trim at the corners getting in the way of your aquascape. The overall effect is very contemporary, and this tank is sure to enhance any room. The Vertex tank comes with a quality HOB filter, thermometer, fish net, and plastic lid, so all you need to do is add a good aquarium heater and a light and you’re ready to rock. If you want an all-in-one package that looks great and really highlights your Betta, this tank should be on your list. If you prefer the looks of a round tank, this 2.65-gallon starter kit is an excellent choice. Made of high-quality plastic that’s tinted at the edges to look like glass, the Marina 360 is solid and looks great. A pump and filter are concealed in the pillar at the back of the tank, and there’s plenty of space to add in a heater. This tank also comes complete with filter cartridges and LED lights. The Marina 360 is a top notch tank for any Betta. The BioBubble Wonder Bubble Tunnel Kit is a unique 1.5-gallon tank that provides endless entertainment for you and your Betta. Positive water pressure keeps water in the overhanging tunnel and allows your Betta to swim up and out through the other side. Because of its unique shape, this tank may be tough to clean well, but the fun of seeing your Betta play in the suspended tunnel may be worth it. If you have an adventurous Betta that loves to explore, this is the perfect tank for him. This fishbowl-style small Betta fish tank features a unique waterfall feature that creates the soothing sound of running water. An all-in-one system, the Tetra Waterfall Globe has a cartridge-based filter tucked away in the rear pillar. This 1.8-gallon tank also features LED lights to highlight your Betta’s coloring. The waterfall from the top may be a little strong, but adding a floating Betta log to your tank helps reduce the flow and gives your Betta a perch to hang out on. This is a great little tank that puts an interesting spin on the traditional fishbowl. 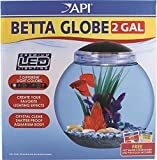 The API Betta Globe is an affordable 2-gallon fishbowl without a whole lot of bells and whistles. But that doesn’t stop it from being a great small Betta fish tank. The Betta Globe is made of impact-resistant plastic, so you won’t need to worry about it breaking like some of the cheaper bowls on the market. It also features LED lights in 7 colors, so you can have a little fun with how you display your Betta. It doesn’t come with a filter or a heater, but for an inexpensive and simple Betta tank, the API Globe is tough to beat. The best small betta fish tanks on this list are all great choices for your Betta’s home. Some offer the convenience of an all-in-one system, some feature stunning design or unique features, and some are more barebones and affordable. 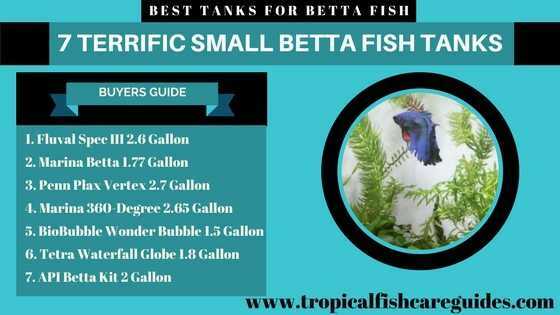 However, the best way to ensure your Betta is happy and healthy is to have a tank that is at least 5 gallons; Click here to read our post featruing 6 Superior 5 Gallon Betta Fish Tanks For Under $100. Liked This Article? Please Share! Jack Dempsey has over 20 years of experience with freshwater aquariums, his goal is to help beginners avoid the biggest mistakes when getting started. If you find something helpful please share it on your favourite social network. If you need help with anything send Jack a question. Betta Fish Tank Setup: Learn how to set up a Betta tank the right way. The Ideal Betta Fish Tank: You may need more than you think. 12 Of The Best Betta Fish Tanks: That you can buy this year. 29 Excellent Betta Fish Tank Mates: The biggest list on-line. Best Filter For Betta: Find a filter that's just right for your Betta. Best Betta Heaters: Juuuuust right! Can Betta Fish Eat Tropical Fish Food: The answer might surpise you! Breeding Betta Fish: The quickest & easiest guide to breeding Betta fish. 19 Cool Betta Fish Tank Ideas: That will blow you away! 7 Awesome Betta Fish Aquaponics Kits: For your home. 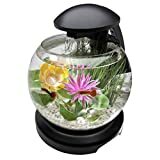 Self Cleaning Betta Tanks: A few better options. Best Sponge Filter: For Betta and other small fish. Jack Dempsey has over 20 years of experience with freshwater aquariums, you can read his story here. Jack's goal is to help beginners avoid the biggest mistakes when getting started. If you find something helpful please share it on your favourite social network. If you need help with anything click here to send Jack a question. TropicalFishCareGuides.com does not intend to provide veterinary advice. We go to great lengths to help users better understand their aquatic friends. However, the content on this blog is not a substitute for veterinary guidance. For more information, please read our disclaimer. The owner of this website is a participant in the Amazon Services LLC Associates Program, an affiliate advertising program designed to provide a means for sites to earn advertising fees by advertising and linking to Amazon properties including, but not limited to amazon.com or any third party affiliated with amazon.com. Amazon and the Amazon logo are trademarks of Amazon.com, Inc, or its affiliates.